Melanie is working to prove her catering business is a world class operation, so when she is offered the opportunity to provide the food at Ahmed's wedding, she can't say no - even though they once shared a night of passion. When a stranger offers her $100,000 to stall the wedding, it's hard to refuse, especially when the connection between them is reigniting with a vengeance. Letting go of the past isn't so easy though, when Melanie reveals a secret of her own. Now, Ahmed will have to choose between being with the woman he's falling for, and saving his fiancée from a loveless marriage to another man. With his entire future at stake, can Ahmed find happiness for himself and the women in his life? 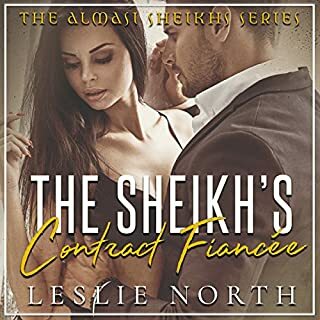 The Sheikh's Accidental Heir is #02 of 03 in the Sharjah Sheikhs Series by Leslie North. All 3 are currently published with 02 being in audio. #3 should be out in audio soon. Sheikh Ahmed Al-Qasimi is the baby of the family. He feels overlooked and under-used in his family. He is never given anything of importance to oversee, only frivolous things that his father or brothers don't want to waste their time on. It's getting old and boring and he longs for something more. When Ahmed spots a stunning green eyed brunette member of the catering staff, he knows he definitely wants more of her! During their late night rendezvous, Ahmed confesses he has not had the pleasure of truly seeing New York and Melanie agrees to a weekend of helping to rectify the injustice. A no strings attached Cinderella story that ends at midnight on the second day. And it does, but their time together leaves lasting impressions on the pair in more ways than one. Melanie doesn't want to derail her plans with the complication of a relationship and tries to avoid Ahmed, but he has decided he wants his little American and is going to do whatever it takes to get her back into his life. Of course it's not going to be that easy! Ahmed's father is up to his old tricks with unwelcomed surprises. There is a mystery man offering Melanie a large sum of money out of nowhere. There are more secret weddings, babies, and of course HOT hanky panky! This is my second read/listen by Leslie North, and I am trying to sit on my hands in anticipation for book #3, which is not in audio yet! The ebook is currently available if you can't wait. Her writing is excellent! The covers are still HOT! This is my second listen by Nicholas Thurkettle, and I'm still in love! He humanizes all of the characters, no matter the gender or age. He uses a slight accent for Khalid and his family that sounds like it could be the way the characters would really talk and not a gimmicky accent that is often done for people in that area of the world. Nicholas did another amazing job when he narrated this. I loved the emotion and sass he projected into his narration. I've always loved books where bad boys turn good(ish) and uptight girls learn to let loose. Hearing about Ahmed and Melanie and all the obstical they have to go through to find their happily ever after is well worth listening to or even reading. Stories like this where accidents happen make the sweetest most wonderful endings. I loved all the wonderful twists that Leslie put into this story and I can't wait to hear more of her works. Great plot with excellent narration! The characters both grew in their own ways, some more than others, in this sweet yet spicy, story. This is an enjoyable audiobook for sure. This is a voluntary review of a gifted copy. 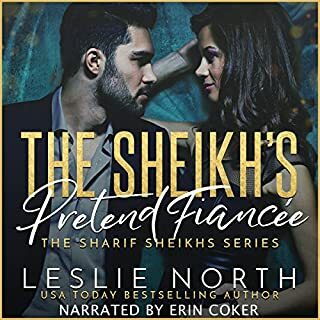 I've read/listen to a few of Leslie North's books with the men from the middle east...Always a fun quick and hot read. The men quickly come to appreciate their American soulmate, and it's fun getting there. Ahmed is in NYC with his two older brothers because his father feels he needs to become more responsible. As you find out he may play around but he really isn't a heartless player, but seeking his own place in the world and giving he finger to his father. He meets Melanie and they have a quick two days affair that neither can forget...well the condom broke on the last time they made love and so is explained the title of the book. Pick it up, fun entertaining, not full of unnecessary angst...HEA. Would you listen to The Sheikh's Accidental Heir again? Why? What was one of the most memorable moments of The Sheikh's Accidental Heir? I loved the wedding -- I don't like giving away spoilers in my review, so I will keep the answer short. What about Nicholas Thurkettle’s performance did you like? I thought the narrator Nicholas Thurkettle was able to perform so many various characters with distinguishable voices. I really enjoyed the whole book. 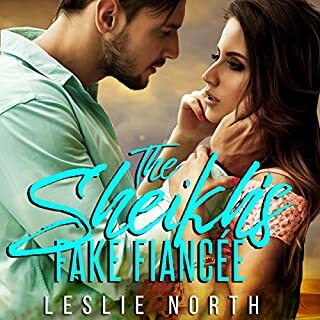 Leslie North is a talented author that writes so many great stories with interesting characters and unexpected twists. I was voluntarily provided with this review copy audiobook at no charge by the author, narrator and/or publisher. I will definitely look for more books by both the author and narrator. Thank you Leslie North for another great book that I can listen to while mommy duties never stops. Love the narrator Nicholas Thurkettle. Lovely, Leslie North has done it again. I can't wait for the next brother's story. Easy-to-read, Entertaining, Funny Great world building, Happily Ever After, Page-turner, Romantic, Steamy, Wonderful characters. Very nice listen, perfect for a hellish commute. I was given this free review copy audiobook at my request and have voluntarily left this review. This story is about Melanie, an up-and-coming caterer, crossing paths with a sheikh who is about to be forced into an arranged marriage. While in 'real life' a coupling of this sort would never happen, this is why we read/listen… To be swept away in a fantasy. Melanie is an independent woman, entrepreneur and depends on herself alone. The Sheikh is a grown man who has never had to do anything for himself because of status and wealth. However, marrying a woman his family has picked out for him is not appealing. He asks Melanie to create diversions that will postpone his nuptials. The 2 of them have a one night tryst complicating things even more. Should she continue with the plan for a delay in order to collect the $100,000? Or will other factors lead her in another direction? I invite you to follow me on Audible for more reviews. If my review was helpful to you in deciding whether or not to purchase this book, would you take a moment and select 'yes' below? Thank you.